How much value does planning approval add to your house? When it comes to selling your home, everyone is after two things: a good price, and a quick turnaround. While there are many tips for getting the most out of your sale, adding planning permission might just be the best industry secret. Not only can it make a significant impact on your house price, it is a relatively cheap and painless process. Does planning permission add value? Adding planning permission to your home will typically increase its market worth. However, how much value this equates to can depend on a number of things. Homeowners in prime London locations could see as much as a 10% rise in their house price, while homes in other parts of the UK might see nothing more than an extra thousand in value. It’s difficult for the industry to know how much planning permission adds on average, as for many homeowners, the goal to planning permission might be as simple as reaching the asking price. Perhaps even to just get close. The only thing that can be said for certain, no house price has ever suffered due to added planning permission! If you want to create some serious cash from planning permission, there is one big money option. While the prices of houses can struggle to improve more than 10%, this isn’t the case for plots of land. If you’re sat on some agricultural land, and you get permission to turn this in to a residential plot, this alone could see it’s worth go up by as much as 10,000%! Think we’re joking? In Kate Barker’s book ‘Housing: Where’s the plan?’ she notes that in areas around Cambridge, agricultural land with no planning permission was worth around £18,500 per hectare in 2010. Changed to residential land, this went up to a whopping £2.9m. So how can your home benefit? Well first, you’re going to need enough agricultural land to sell. This might be the case if you live in a country home, and have plenty of land surrounding your home. If so, your best bet would be to sell the land and your existing house separately. This would give you both the maximum worth of your home, attracting both everyday homeowners and developers. It’s worth bearing in mind, the impressive stats listed above are mainly applicable to land in areas where homes are at a premium. Think London, Cambridge, Oxford, and Belfast. For land outside of these areas, you’ll be looking at significantly smaller sums. You’ll also be facing a more contentious planning process. Planning permission of this kind is the most likely to face rejection, so for this reason, so we recommend getting an architect on board to help prepare your application! At Resi, we help hundreds of homeowners achieve planning permission every year - many with the desire to find their home a new owner. Take this London home. Wanting to appeal to future buyers, Resi was called in to create designs that could show off this property’s full potential. 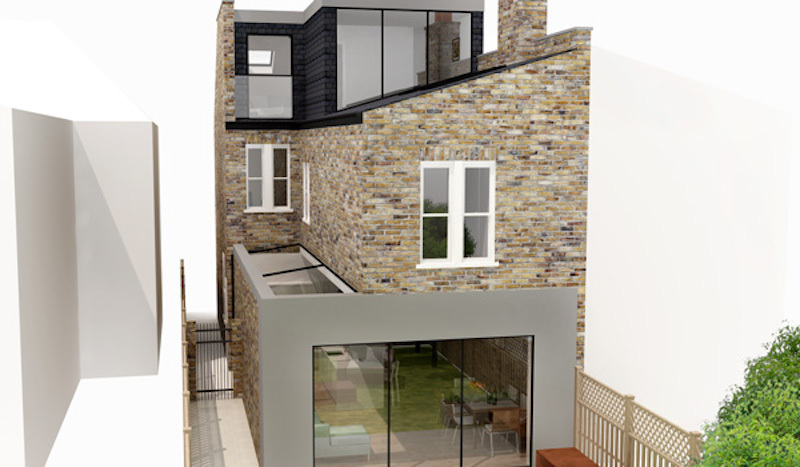 First we started with the ground floor and showed how much space could be generated by adding a side extension. This fully opened up the facade, and would let in reams of natural light with large windows and a skylight. We then also played around with the floor plans for this level, introducing more facilities for a growing family, like an extra bathroom. We also proposed an open plan kitchen and diner, which is great in both the colder and hotter months for hosting any gatherings. Finally, we turned our attention to the loft area, which was then being used for storage. To maximise space, we suggested a loft conversion that would take this space to the next level as a bedroom and office. Working within permitted development rights, therefore minimising the planning headaches in the future, we created these rooms as an L shape. And again, we gave special attention to bringing in as much as light possible. Making this the perfect space for any studious buyer. By showcasing these designs with the property, not only was the owner able to find a buyer, they were able to achieve the asking price - £100,000 more than they were expecting. If you’d like to discover how Resi can help unlock your home’s potential, why not book yourself in for a free consultation? By talking with our experts, you can discover the best way to maximise your house price, all free of charge.